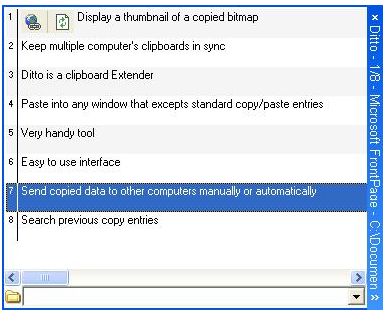 If you copypaste a lot (and if you read this blog, you probably do) – then you won’t regret starting to use a clipboard manager. I use it daily now, several times a day. I’ve used it to write this post. I count on my clipboard now more than ever, and it’s like having a giant, searchable, saved-to-disk, copy of all the ‘copys’ I had in weeks. It remembers images, not only text. It has got shortcuts, for those times you need to paste 3 things in different places. And it’s just been a good friend in the past 3 years I’ve used it. Every time I fire Ditto up (Ctrl+` has actually become a fun key combination 😉 ), and start going through my past ‘copys’ – I feel like I’ve just saved so much valuable time. A couple of days ago I met a couple of friends that worked with me. They all agreed it was the most useful recommendation I ever gave them. It was such a funny conversation. What tool can make you appreciate it so much??? It’s better than a guitar! They all recommend it to everyone they work with… Hell, we loved it so much at the time, that we even opened a Facebook group for it 🙂 – http://www.facebook.com/group.php?gid=51343612903. Free, open-source, fun. I don’t get a dime for this. Just your future self thanking me till the end of time. Might not the best one out there – but the best one I’ve found. And it’s awesome. How the hell do you get this working as a network clipboard which is all I require, many many menus for such a basic use. what the heck is the ‘Eent To’ option for, I thought that if I highlighted the clip on on computer ‘right click’ then select ‘Send To’ might be sensible but it has no submenus. I read that this is a very well thought of program but I’m beat, an ideas on a program that is simple/obvious to use to get a clipboard across network ( local LAN ). Wow, never tried it as a network clipboard. (Another thing, it’s been a while since I’ve used it. I need something like this on Mac, now, though…).